Looks like somebody is happy with how their newly acquired franchise performed. These Eidos games are coming up big for Square Enix during their own creative draught, and Hitman Absolution has obviously turned a few heads up at a boardroom somewhere. Obviously, they need to strike while the iron is hot before Agent 47 falls back into the shadows, and what's the best way to ride a hype train with a few easy extra dollars to the bank? An HD release, of course! 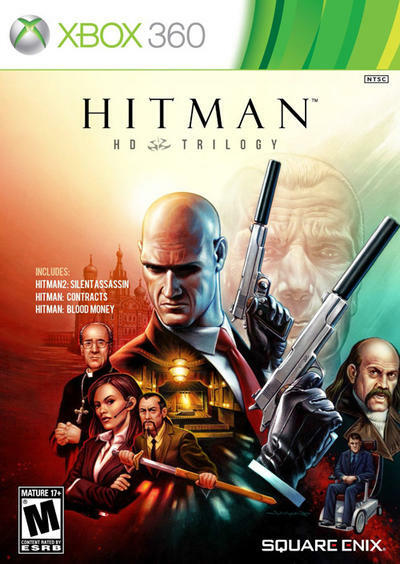 Square Enix has yet to officially announce the Hitman HD Trilogy, but the bundle appeared on Amazon.com earlier today, and if their listing is more than just speculation, it will be released as soon as January 29th for the Xbox 360 and PlayStation 3. All three classic Hitman games will be available on a single disc for $39.99. Hitman 2: Silent Assassin, Hitman: Contracts, and Hitman: Blood Money are all nice little games worth the asking price, but the games often appear on Steam for as low as $2.49 a pop during holiday sales. Not to mention this is the second trilogy pack to be released within the last few years. A PlayStation 2 box set is also out there for cheap, and I am certain at least Blood Money supports component cables. Still, these appear to be fully reworked HD remakes with full Trophy and Achievement support, and it even comes with an exclusive artbook. Be sure to check the entire Hitman Trilogy out if they've eluded you up until this point, no matter how you purchase them. These were advertised to be released for the Xbox 360 and PlayStation 3 on January 29th. Square Enix has yet to comment.